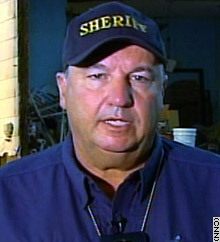 St. Bernard Parish Sheriff Jack Stephens said he may not be able to pay his officers much longer. NEW ORLEANS, Louisiana (CNN) -- The White House said Wednesday it would ask Congress to allow federal funds to be used to pay the salaries of first responders in Louisiana parishes left strapped for cash by Hurricane Katrina. Under the Stafford Act governing disaster relief, federal funds cannot be used to pay the base salaries of local government employees. It can be used only for overtime pay. The White House said Congress is expected to vote on a measure to ease the rule by the end of the week. The action followed pleas for help from several officials in Louisiana, including U.S. Rep. Charlie Melancon, who earlier Wednesday sent letters to President Bush and House Speaker Dennis Hastert urging them to change the Stafford Act prohibition. Melancon, a Democrat who represents much of southern portion of the state, hailed the administration's move. "I'm glad to see that the president understands that and is making an effort to keep these parishes from collapsing completely. I hope Congress will follow suit," he said. Melancon noted earlier that because most residents have been forced to leave, local governments cannot collect sales or property taxes -- money that would be used to pay essential workers. Louisiana has a $1 billion deficit and is running out of money to pay police officers, firefighters and other emergency workers in the affected areas, said a spokeswoman for Gov. Kathleen Blanco Wednesday. "We consider it a very real crisis in the next few days because they'll have to lay off law enforcement officers, and we'll have no fire protection," spokeswoman Denise Bottcher said. On Monday, Blanco warned Congress and the White House that many of the state's local governments "are on the verge of financial collapse" in the wake of the most destructive hurricane in U.S. history. In St. Bernard Parish, east of New Orleans, Sheriff Jack Stephens pleaded for help from state and federal officials Wednesday, saying he could not meet his payroll for 182 law enforcement personnel. Stephens said he was tempted to use FEMA funds earmarked for temporary housing for deputies to make up the payroll shortfall, even though such a move would be illegal. "We are wiped out levee to levee. Absolutely no business activity. These people [first responders] have been asked to perform under the most extreme conditions. They have been loyal and gallant," Stephens said. Bottcher told CNN the state has been funding payrolls in St. Bernard and other parishes since September but could no longer help because of the rapidly increasing deficit. In a related development, the chief of two principal hospitals in New Orleans -- Charity and University -- declared the facilities unsalvageable Wednesday and said they will need hundreds of millions of dollars to rebuild.